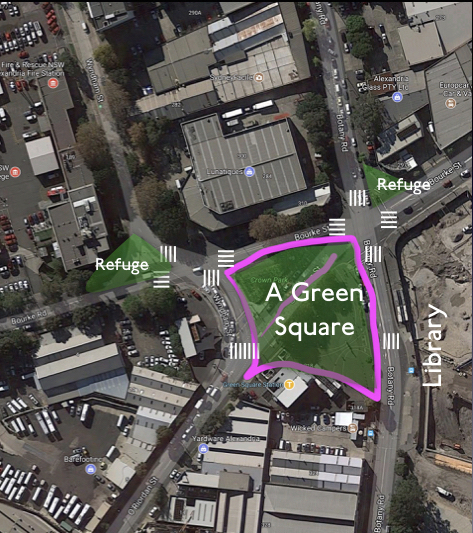 I wrote a piece for WalkSydney: Green Square deserves a (pedestrian-accessible) Green Square. We have a high-frequency service train station. Across the street we have a Library. But we are not supposed to cross the street, as there is no intersection, no HAWK signal, no Zebra crossing, none of the animal menagerie designed to protect pedestrians from the onslaught of the more important motorised vehicles whose speed shall not be diminished. Casual empiricism suggests before the most recent installation of barricades walling off the library from its patrons, many people did, in fact, cross the street midblock in an organic but unorganised fashion, exhibiting the desire lines that ought to govern how the street system is arranged.